And, we’re back! After a bit of a stumble on my training program, I jumped right back into it and I am feeling better about my progress. Related to the topic of motivation that I discussed last week – I find myself in a period that I call “The Grind.” The Grind is that point where your training program really pulls a lot of your attention from your normal life. Up until the last few weeks, I could have pretty much eaten whatever I wanted, stayed up late, and drank as much as I wanted. These days, I have to be more careful with my schedule and what I put in my body. And it is a grind. In general, I always have my long runs on Saturday morning. As I get up around 20 miles, that means I will be out there running for over three hours. If I get up late, that means I don’t get done until even later, and there goes my entire Saturday. So that means I have to go to bed pretty early on Friday, to wake up around 7am on Saturdays, after getting 7 hours of sleep. I generally need to keep hydrating myself throughout the week, but on Friday especially. So I am drinking water constantly, avoiding coffee and all alcohol — and spending a lot of time in the bathroom. Naturally. I also add a bit more carbohydrates into my diet on Fridays and also have to make sure that I have my almond butter and whole wheat bread for Saturday’s breakfast and that I am stocked up on my running fuel. Throughout the week I now have to map out my workouts much more rigidly. I can’t strength train too close to my long run anymore and I schedule a day of rest for each week. My long run was pretty uneventful, except for the moderate winds that made it even harder. Over the weekend, NYC braced for a tropical storm but all we got was a lot of humidity and wind. Hurricane Earl was a no-show! This might be a Los Angeles thing I have brought with me to New York, but I am very very rarely without a bottle of water in close reach. If you don’t see it on me, it’s probably in my purse and it’s usually a gigantic bottle. My car in LA used to be an empty water bottle graveyard. I find that however much water I surround myself is how much I can drink. If I have a cup of water, I can just drink that and be satisfied. Or I can have a 1.5L bottle and take it down in less than an hour. So when you are trying to drink more water, buy the biggest bottle you can find and just keep it on your desk. Be like those fish that grow to fit their tanks. Grow to fit your new, larger water bottle. 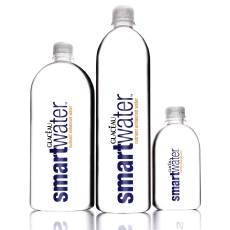 Once you finish one off, fill it up again, and on and on… I favor the 1.5L smartwater – not really sure why – but I usually make an effort to finish one whole bottle before lunch and another one before I leave. On Fridays, I try to finish three. You are currently reading 9 Weeks to NYC Marathon: The Grind at Quite Continental.